Receive attunement, manual, certificate and handouts. There are no prerequisites. Increases your energy and gives you the knowledge and ability to work as Reiki Practitioner. 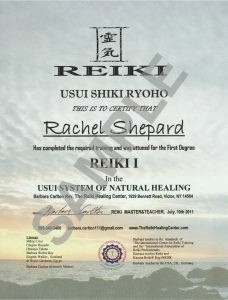 It certifies you as a Reiki Practitioner. Receive attunement, manual, certificate and handouts. Prerequisite: Reiki level 1. Receive attunement, manual, certificate and handouts. 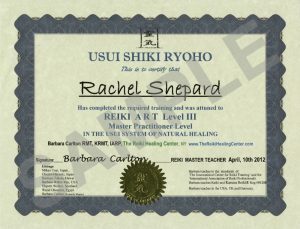 Prerequisite: 6 month waiting time since Reiki level 2. The title “Reiki Master Teacher” (RMT) is the highest level for Reiki attunements. It is either taught over 2 days in a group, or 2 days one to one. Please enquire what suits you best. Receive attunement, manual, certificate and handouts. Prerequisite: Reiki master level. Children will get in touch with subtle energy and learn simple methods of using Reiki. The Center is affiliated with the Reiki Kids center in Canada who has been teaching children for years now. We teach to their standards and are also using their Reiki Kids manual. Classes are over 4 hours and 2 more sessions of practicing Reiki. There is ongoing support. This is a Reiki I certification course. You will receive Certificate and Manual. Reiki is a complete system of holistic, natural healing. It is a primal and basic form of healing, and everybody has the ability to perform Reiki healing once learned. It is ideal for all ages because in the process of learning Reiki, they learn about their bodies, their inner spirit, their personal power and their connection to the universal Life force which surrounds us all and is universal love. Reiki Teenagers was created to provide information for teenagers interested in learning about Reiki, and honoring their uniqueness. We offer encouragement and support on their journey; it is always good if the parent can give their support as well. We have a Reiki Support Group.